When 20th Century Fox announced their Comic-Con 2014 plans last week, many fans were surprised that The Fantastic Four was not one of the movies the studio plans on showcasing. It has been rumored that all five main cast members, Michael B. Jordan (Johnny Storm), Miles Teller (Mr. Fantastic), Kate Mara (Sue Storm), Jamie Bell (Ben Grimm) and Toby Kebbell (Victor Von Doom) will make an appearance, but the studio has not confirmed that at this time. Even if The Fantastic Four doesn't have a presence in San Diego next week, Michael B. Jordan revealed a number of new details about his highly-anticipated reboot in a new interview with MTV, where he says the script is constantly evolving and calls the project a grounded and unconventional superhero movie, while discussing his reunion with Chronicle director Josh Trank. The actor first revealed that the project is so massive that the script is constantly changing, with on-set decisions being made "on the fly." "Yeah, we have been pretty much in our own world, that's really the only way we could get a project like this done. It is so massive, so many moving parts, so many moving pieces, things are changing every day. The script is evolving, [you make] on set decisions on the fly, things are always constantly changing. Me personally, I block out that extra noise and I focus on the job I have to do. It is an important film for all of us... We're taking it seriously, taking a lot of risks. I think it's going to pay off." The actor also said that, while director Josh Trank has a very clear vision, he does give the actors plenty of room to try new things, while stating that the reboot is not your garden-variety superhero movie. "As much as everybody thinks that these projects are cemented in years before, they're not. There's so many things that you just can't account for. You know, you can try and plan as much as you want, but you get there on game day and you get thrown a curve ball, I guess, hey, the game plan goes out the window. You've got to adapt. Josh's vision is very clear and he knows exactly what he wants, and he gives us room to adapt and to play. That's what I kind of think sets us apart, is that this is going to be grounded and unconventional. It's not your typical superhero film, you know, we aren't looking at this as like, being superheroes. We're more or less a bunch of kids that had an accident and we have disabilities now that we have to cope with, and try to find a life afterwards - try to be as normal as we can." When asked if this would be an "angstier" version of these superheroes than previous versions, the actor had this to say. "Yeah, I mean we've just got layers. We're trying to make it relatable to people as much as we can [with these] larger than life, larger than this world themes. It's superheroes! You know, not just superheroes. It's fiction. You've got to ground it as much as you can to make [audience members] feel relatable to these characters, no matter what age they are or what time of their life. One of the good things about The Fantastic Four is that everybody is different. And it's like, sometimes family doesn't always consist of your relatives or by blood. Sometimes your best friends can feel more like family than your cousins. I think everybody kind of has that same feeling. When you go through an accident together, when you go through a traumatic event, sometimes that brings you closer together. Yeah, everybody takes their time out to kind of deal with their own stuff, but at the end of the day, you shared a common experience together that you're able to relate to. The people, the public, the fans that are watching this can all relate to that because everybody has had to overcome an obstacle in their life before." 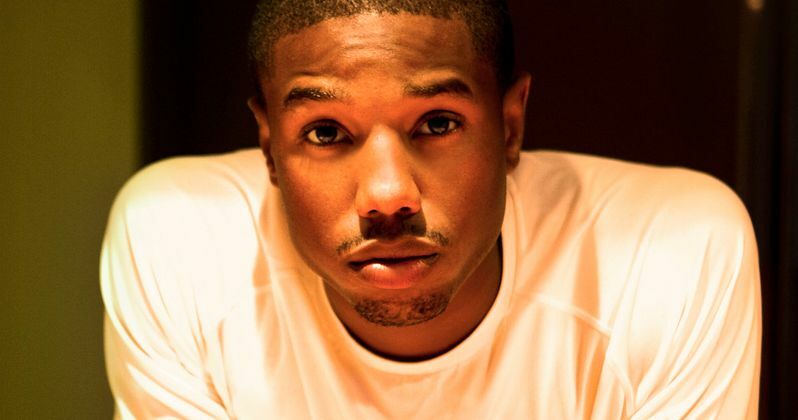 Both Michael B. Jordan and director Josh Trank were put on the map with the 2012 found footage thriller Chronicle. When asked if working on a bigger movie has gone to his head, Michael B. Jordan offered the following response. "Nah, not at all man. Like Biggie said, "mo' money, mo' problems". He hasn't changed. I think he's grown and matured, as we all have. Me and him, we've become closer friends, which makes it easier on set for us to talk to each other and explain what we're feeling and how we're going to approach these things and I think that's very important. But yeah, we didn't have that big of a budget on Chronicle and now we have a pretty big budget - I'm not sure of the exact number. Now you're actually responsible for more. So he's more locked in and more focused on what he has to do, but he's the same in all the ways that really matter. He's still super creative and super collaborative and he knows what he wants. That's very important. If you don't really know what you want and you're just kind of like 'Oh, let's see what happens,' I think that's the wrong approach for this project. I think he's very specific, which is what we need." The actor also spoke about working with Toby Kebbell, who can currently be seen in theaters as the villainous Koba in Dawn of the Planet of the Apes. "Working with Toby is a blast. I've always been a fan of his work and respected him tons. I never got a chance to meet him, but I heard he was coming on board and I got really excited to be in scenes with somebody that you respect. Off set and on, he's a leader. He's pretty funny. We get along great, man. So you know, actually, it's a blast. It's been really good. Sometimes he'll start mimicking or go into his ape stuff for a while. You know, just like in between sets. I was asking questions about it because I was actually curious about the preparation that [he] went through to play Koba, to play ape in that film. He tips his hat to Andy Serkis. He says that guy is just phenomenal. I have yet to meet Andy but I have tons of respect for what they do and it's pretty incredible." He was also asked if the fans may get their first look at The Fantastic Four footage at Comic-Con, but the actor isn't aware of any plans to bring the movie to San Diego. "No clue. I haven't even seen anything on set, okay? And I'm here. I'm barely watching playback, so honestly I have no idea about any of that stuff. I think they're still trying to figure out the direction and what they want to do, so I'm not sure."